The Kwethluk River opened on April 3, 2019. It’s only the first week of April, and many tributaries along the Kuskokwim River are relatively ice-free. In some, boating has begun. A strong wind opened the water of the Kwethluk River on Wednesday. Kwethluk Tribal Operations Manager Chariton Epchook says that by 3 p.m., open water extended in front of the community. The same strong wind also cleared ice out of the Eek River on Wednesday. Eek resident Katherine Chakuchin says that ice remains along the banks, but open water spans the middle of the river. Hours after water opened, Chakuchin says that she saw two boats head out to go bird hunting. The Johnson River has opened in front of Nunapitchuk. Police Chief Jay Alexie Sr. says that the open water stretches to the lake upriver of the community. Boats started going out early this week. “By boat they’re going out pike fishing now. Probably they catch about close to 100 in a couple hours,” Alexie said. With boats able to cross the water, that means most Nunapitchuk students are able get to school again. The Johnson River divides the community in half, and students who live on the side without the school miss class when the river is unsafe to cross. Spring time has also come early to Aniak. “Very early; at least three weeks early,” said Aniak Tribal Administrator Wayne Morgan. People began boating on the Aniak River over the weekend. “Some people, since it was a nice weekend, 40 to 50 degrees, were out camping this past weekend at their cabins,” explained Morgan. Aniak sits on an island. Morgan says that the Aniak River began opening weeks ago, and fully opened this weekend. By Wednesday, the Aniak Slough had also opened through a few bends downriver of the community. Where the Aniak flows into the Kuskokwim River, the ice has opened about 100 yards. Morgan says that what Kuskokwim ice remains looks white, which in years past has signaled solid ice. This spring, however, people along the river are reporting white ice that is sometimes only inches thick. Upriver in Nicolai, resident Dan Esai says that the Kuskokwim ice was white on Sunday when it melted out. “It was needle ice, and it looked like a false impression of good, solid ice,” he remembered. Open water now stretches in front of Nicolai. It’s too shallow for boating, but that could soon change. Esai says that there’s a big snowpack remaining in the surrounding mountains. When that melts, the water level should rise. He is also seeing other signs of spring: swans and ducks have arrived in the area. Search and rescue groups along the Kuskokwim river are warning everyone to stay off the ice. It is not safe for travel, following the region's warmest February and March on record. Correction: The original version of this story said, "It [the Kuskokwim River] is not safe for travel, following the region's warmest winter on record." That informtion is unconfirmed. 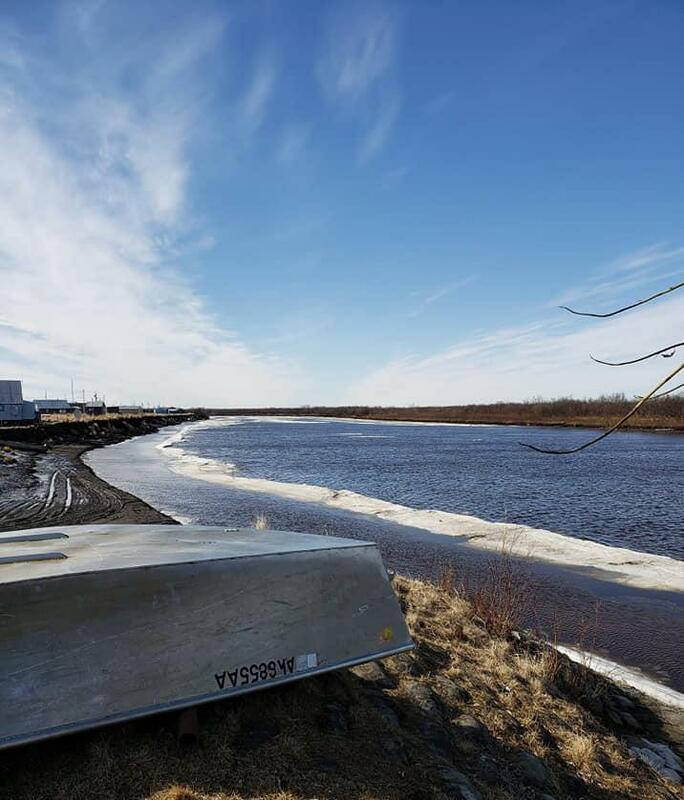 The story has been corrected to say, "It [the Kuskokwim River] is not safe for travel, following the region's warmest February and March on record."